NOTE: The practices we share we with you are simply an example of the many ways that WLC game players can accomplish their daily mobility. These are intended to help you explore both your body’s potential and the vast world of movement. She is the co-founder of Tune Up Fitness Worldwide and creator of the self-care fitness formats Yoga Tune Up and The Roll Model Method. She is the author of the internationally bestselling book The Roll Model: A Step by Step Guide to Erase Pain, Improve Mobility and Live Better in Your Body. And, she has trained thousands of movement educators, clinicians, and manual therapists to incorporate her paradigm-shifting self-care into athletic and medical facilities around the world. And now — you can learn from Jill completely for free with the follow-along videos we’re sharing with you today. Even though these videos are labeled by “week,” you can do these in any order or fashion you like. Try a different one each day or do the same one for a number of days. Experiment until you find what makes your body feel good and move well. This series is not only about helping your body move and feel better, but it’s also about your relationship with your body. You’ll start with your breath, and with each new follow-along video, you’ll increase your connection to your body (and probably your heart and soul, too). Note: The techniques in these videos can be adjusted to all fitness levels and body types, and Jill will demonstrate how. But remember to listen to your body and back off if something doesn’t feel right. Explore the different areas of your body and give some love to some likely neglected parts. Just hit play and follow Jill’s instructions. You’ll learn some anatomy, and you’ll find some new ways of communicating with and listening to your body, as well. Jill Miller has been a force and leader in the world of mobility and yoga for years, is a new mother, and is incredibly humble and transparent about the bumps along the way (including her struggles with an eating disorder, injuries, and a hip replacement). Click here to listen to our podcast with Jill and hear her incredible sharing of her very personal story. Becca earned her MFA in Cinema-Television Production at USC’s famed film school, and her first career was as a music editor. Becca found her way to career number two through martial arts. She trained in BJJ and muay Thai and worked with professional MMA fighters, building websites, organizing fight promotions, and producing videos. 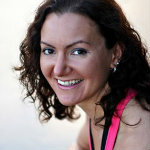 In 2005, she became a student at CrossFit Los Angeles where she met WLC co-founders Andy Petranek and Michael Stanwyck. In only a couple years, she became CrossFit Level III Certified, left her entertainment career, and dedicated herself full time to coaching, serving as the Program Director of CFLA and founder of the CFLA CrossFit Kids program. After seven years as a music editor and then eight years as fitness instructor, Becca segued to her current career — full-time editor and writer.